Congratulations to last week’s winner: Jessica Lippe — please e-mail your mailing addresses to my assistant (amy@triciagoyer.com)! Enter below for your chance to win a copy of Homeschool Basics! It’s easy to think about focusing on relationships with others. It’s harder remembering that we also need to nurture our relationships with ourselves. 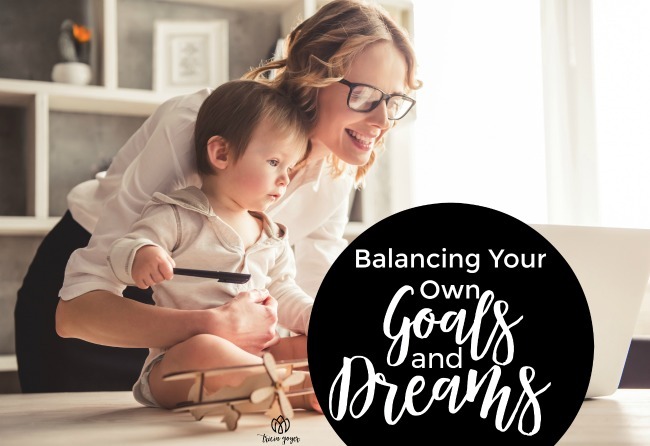 It’s very easy to convince yourself that you to give up all your goals and dreams to homeschool your kids. But by watching you follow your dreams, your kids will learn more about how to follow God and the reams He lays upon their hearts as they see you do it. When I first started homeschooling my three kids (ages six, three, and one) in 1995, I thought my life from that moment on would always be about homeschooling. I pictured all of my time (or at least most of it) would be spent shaping my children’s education. I schedule my day in fifteen-minute increments and did my best to stick to it. What I didn’t know was that over the years, God would call me to follow my own dreams. What I also didn’t realize was that my kids would benefit from my obedience. It all started when I attended the Mr. Hermon Christian Writer’s Conference with a friend. Being with industry professionals made writing for publication seem possible. Classes taught me how to get published. The love, prayers, and support of published authors and editors brought people into my life who believed in me and prodded me to follow God’s dreams. It didn’t matter to them that I was a young homeschooling mom who hadn’t even finished college. With each call from God, I argued. Lord, what about this homeschooling thing? Shouldn’t I focus more on that? Yes, I was still spending three to four hours homeschooling every day, but I’d look around and see my friends pouring one-hundred percent of their lives into their kids. I felt I was giving my kids less than I should. I can’t say there was an ah-ha moment, but over time, I began to see how following my dreams benefited my children. For them, they’d say they realized having a mom who wrote books was cool when we got free tickets and backstage passes to a Newsboys concert through a writing friends. For me, I’d say it was when I saw my daughter’s compassion for teenage mothers or when I overheard my son telling someone he wanted to write screenplays. They met WWII veterans I was interviewing and traveled all over the US as I researched. As a mom, I didn’t need to teach my kids that we should follow God’s dreams for us and work hard to share His truth with others. They saw that lived out on a daily basis. Being a servant of God was modeled. And here I’d thought I was being a slacker for not doing science projects or having them memorize enough spelling words! As time passed, I realized God asked me to follow my dreams not only for the people I served, but also for my kids. My biological kids are twenty-eight, twenty-five, and twenty-three now. Cory is married with two children. He has graduated from college and is serving as a children’s pastor. He’s also a homeschooling dad. Leslie is married and is a missionary in the Czech Republic. She’s also a professor at a university there, teaching English. Natan is writing his second novel and a huge help to me. Still living a home, he’s an amazing big brother to our seven adopted children. He’s also actively involved in children’s ministry with his dad and older brother. As I mentioned we’ve adopted seven kids who are ages six to seventeen, and I can’t wait to see what God is going to do in their lives. Even though I have seven kids at home, I plan on doing many things the same, including homeschooling, serving teen moms, and writing . . . but this time I’m doing it without the guilt. I trust God more now. I trust that if He’s called me to something for Him, He understands how it’ll impact my kids. I trust He sees their futures, about serving and following God with everything we have. What about you? Has God placed a dream in your heart or you spouse’s heart? Maybe like me you’re thinking, “I’ll do that after these homeschooling years have passed.” I’d encourage you to go to God in prayer. After all, kids learn far more from our lives than from books. You are your child’s teacher . . . teach them with your life, not just your lesson plans. Don’t miss this great price! Only $7.99 while supplies last!! Thank you so much for this post! I am right there. With us in the midst of our first year homeschooling (ages 6, 4, 2, and another due any day), and my first book released earlier this month, I faced (and still do) so many of these thoughts. Your post was incredible clarifying, and encouraging coming from a mom who has walked a similar path. Truly, thank you.